Elegant, dramatic, understated and sophisticated. This simple bouquet of white calla lilies is bound to make a big impact celebrating a very special life. When it is time to pay tribute to someone who's left behind memories of a big life well-lived, this arrangement does so, and with a rare eloquence. 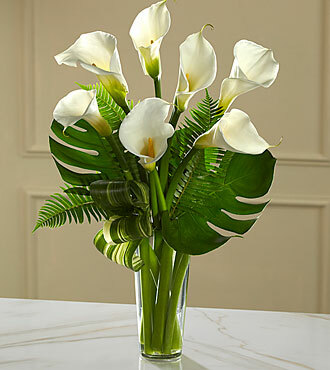 The sleek, sculptural white calla lilies open against a background of sword fern fronds and other greens arranged in a clear glass French vase. Appropriate for a wake, funeral service or to console grieving family or friends at home. BETTER bouquet is approx. 27"H x 17"W.